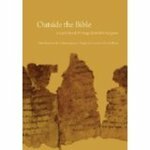 "Outside the Bible: Ancient Jewish Writings Related to Scripture" by Louis H. Feldman, James L. Kugel et al. Copyright 2013 The Jewish Publication Society/ University of Nebraska Press. Feldman, Louis H.; Kugel, James L.; Schiffman, Lawrence H.; and Harkins, Angela Kim, "Outside the Bible: Ancient Jewish Writings Related to Scripture" (2013). Religious Studies Faculty Book Gallery. 48.